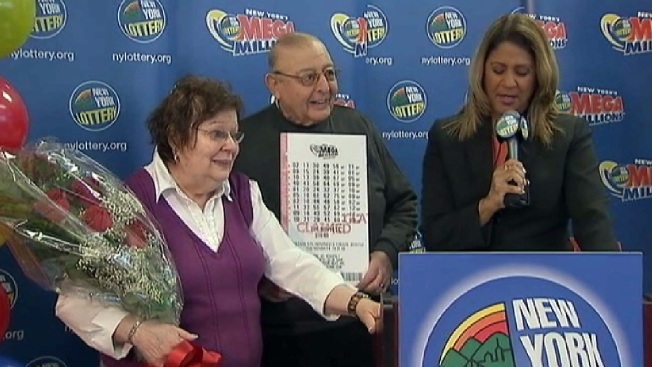 An 80-year-old retired school principal is the sole winner of the Nov. 4 $326 million Mega Millions jackpot, the biggest prize in New York Lottery history. Harold Diamond of the Sullivan County town of Wurtsboro says he bought the ticket at a highway service center where he had stopped at his wife Carol's insistence to wait out a storm on Election Day. Diamond said that he bought 10 tickets for $10, then put them in his wallet. He didn't even check to see if he won until after hearing the winning ticket had been purchased at the service center the next day while playing a round of golf. The New York Lottery's Yolanda Vega presented a giant ceremonial check to Diamond on Monday. He has chosen to take the cash value of the annuitized prize, which comes to about $130 million after taxes. Diamond, who was an elementary school principal for 35 years, says he plans to use the money to help family and give back to the local community. Diamond was the principal at Emmac C. Chase Elementary School in Wurtsburo and George L. Cooke Elementary School in Monticello. He has also been a member of the Wurtsboro Volunteer Fire Department for 50 years.